We had a slow weekend at home last month (sooo nice! ), and decided to spend our Saturday afternoon doing science experiments. This crystal garden was so fun! 1. Put your porous material on the bottom of your dish. 2. Mix 2 Tablespoons of salt with 4 Tablespoons of water in your cup, stirring to dissolve as much salt as possible. 3. 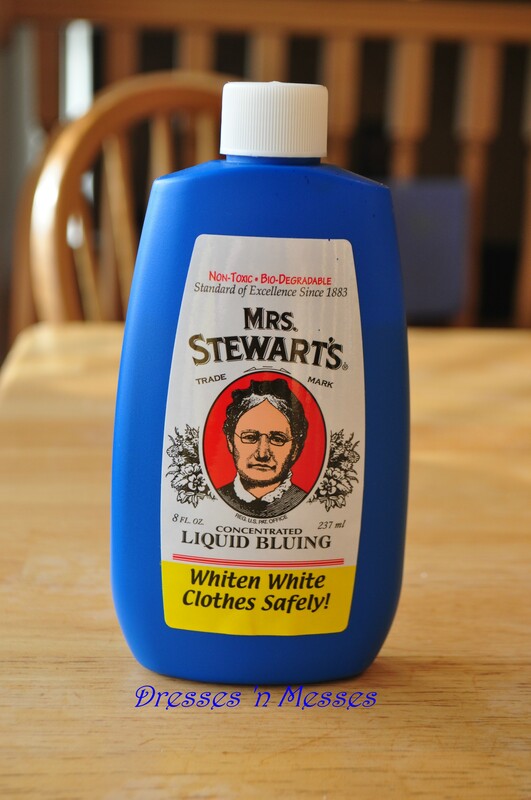 Add 2 Tablespoons each of ammonia and laundry bluing, again mixing as you go. The mixture will be a blue, watery sludge. 4. Pour the sludge, liquid and extra salt, on top of the porous substrate in the plastic dish. Make sure to get all the salt out of the mixing cup and onto the porous items in the plastic dish. All the salt may not go into the solution; that’s okay as long as you pour the extra salt on top of the items in the dish. The porous materials in the dish will not immediately soak up all the liquid; this is okay. 5. The crystals will naturally grow white, like the salt. 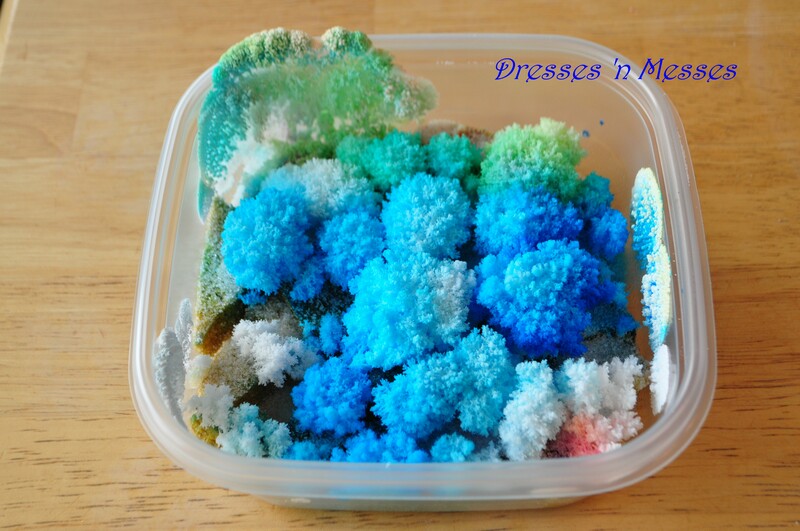 If you want colored crystals, add a drop or two of food coloring on each item in the dish. 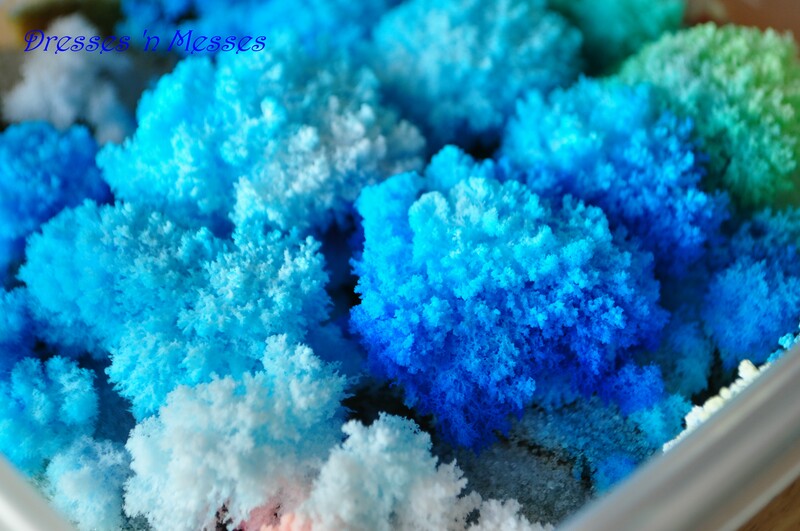 The crystals will grow that color. 7. You can keep the garden “in bloom” by adding 2 more Tablespoons of salt on the second day, then half batches of the whole mixture from time to time. Make sure to pour the liquid into the base of the container and not on top of the already formed crystal blooms, as it will dissolve them and you will have to start over (which is also a lot of fun! ).